Israel is to hold a general election in April, the ruling coalition has said. The political partners decided to call the poll after failing to resolve a dispute over a draft conscription bill for ultra-Orthodox Jews. If PM Benjamin Netanyahu is returned to office he would be on course to become Israel's longest serving leader. However a question mark hangs over his political future, with the attorney general due to decide whether the PM should be charged with corruption. Mr Netanyahu is being investigated on suspicion of committing fraud and bribery in three cases. He has denied the accusations, accusing political opponents of carrying out a witch-hunt against him. By Sunday night it was clear the government faced collapse after ultra-Orthodox parties threatened to withdraw over the draft conscription bill. The bill concerns the long-controversial issue of conscripting ultra-Orthodox seminary students, who have traditionally been largely exempt from automatic military service. Elections had to be held by November next year. 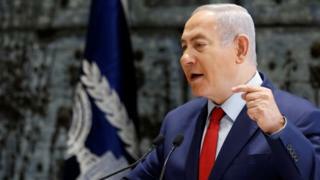 If Mr Netanyahu manages to stay in office beyond 31 May 2019, he will surpass Israel's first prime minister, David Ben Gurion, as the longest serving head of government.